Comprehensive data recovery software. Recover lost data over the network. Recover files on your local computer and on computers across your network. FAT & NTFS, FAT, NTFS, Network, FAT Network, NTFS Network, Technician, Macintosh, Linux versions are available. Supports HFS/HFS+ (Macintosh), FAT12, FAT16, FAT32, exFAT, NTFS, NTFS5 (created or updated by Win2000, XP, 2003, Vista, 2008, Win7), Little and Big Endian variants of UFS1/UFS2 (FreeBSD, OpenBSD, NetBSD, Solaris), Ext2/Ext3/Ext4 FS (Linux) file systems. The powerful data recovery software. Recover accidentally deleted files and reconstruct formatted or corrupted drives. The PRO version of the software adds some advanced data recovery features such as recovery from hardware and software RAID, basic and dynamic disks. 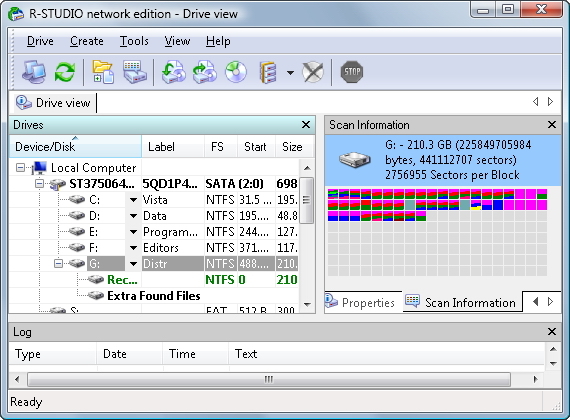 The Network version adds ability to recover files on remote computers. New version suports all Windows VISTA versions. Standard, PRO and PRO Network versions are available. Recover files that have been accidentally deleted, erased, corrupted, or otherwise lost. Try FAT & NTFS, FAT versions for free. Recover corrupted corrupted Microsoft Excel Sheets. New improvements of file reconstruction technology IntelligentRebuild allow the users to reconstruct damaged *.xls files.